Bentley undoubtedly has been delivering luxury and performance since years but it has never presented a SUV in its range of products. Though Continental GT commendably makes its space in the all-wheel-drive automotive but let’s be practical, it isn’t entirely a SUV. 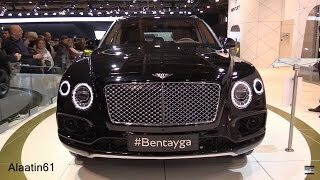 Breaking the trend and creating new legacy, at the 2015 Frankfurt Motor Show, company unveiled its all new Bentley Bentayga 2016. Equipped with a lot of features this new release is set to be a new milestone in automotive industry. 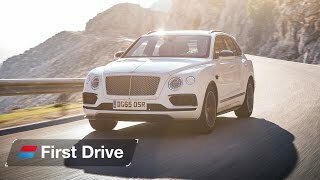 Let us have a look at review of Bentley Bentayga 2016 to know more about it. The interior of Bentley Bentayga 2016 shares a lot of features with its Continental sibling. However it has many features that have been updated to suit the SUV image. This includes steering wheel, dashboard, center stack, raised armrests and wide center console. As the Bentley legacy narrates, the cabin come drowned in hand crafted leather, metal and wood. Facing right in front is an eight-inch touchscreen and center console with large dials. The big controls over the center console allows driver to have command over the features without much of distraction. Front seats come with 22 adjustable ways and offer massage, heating and ventilation functions for a comfortable ride. For the rear passengers entertainment segment includes a 10.2 inch Android tablet that can be used for series of things. 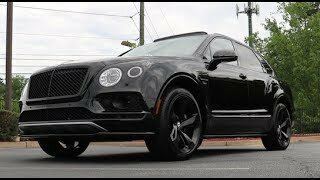 In all the interior of Bentley Bentayga 2016 is luxurious (as you can expect from Bentley), highly comfortable and is adorned with features like hill descent control, adaptive cruise control, electronic night vision and head up display system. Just like the interior, exterior of Bentley Bentayga 2016 holds similarities with the Continental GT. Starting with the front fascia you have a larger grille sitting at the nose of tall hood. On either side of grille are LED circular headlamps. However looking over the side you might find the model looking like any Range Rover SUV I presume this is something general as in SUV market Range Rover has been presenting the best since decades. Moving towards the rear end, oval-shaped taillights sit alongside the conventional lid giving the model a decent touch while the sportive bumper and massive exhaust outlets add to aggressive touch. 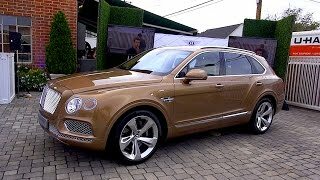 In all the exterior of Bentley Bentayga 2016 is an impeccable amalgamation of class and aggression, though you might not find it distinct but it undoubtedly looks good. Beneath the hood of Bentley Bentayga 2016 is a 6.0 Liter twin-turbocharged W12 TSI engine cranking total output of 600 hp and peak torque of 00 nm mated to ZF eight-speed automatic transmission. With this power rolling the wheels, tops speed of Bentley Bentayga 2016 touches the mark of 187 mph and can knock down 0-60 mph sprint in just 4.0 seconds.